Jacob Wentz is the Catalyst’s foreign correspondent reporting from Pau, France. Thousands of demonstrators organized in streets and highways throughout France over the weekend to protest proposed tax hikes on gas. The activists are organized under the Gilet Jaune, or “Yellow Vest,” movement, a name which references the fluorescent yellow safety vests that French drivers must carry in their vehicles in case of roadside emergencies. Despite offering sympathy for the protesters, French President Emmanuel Macron stood firm on the decision to increase taxes. 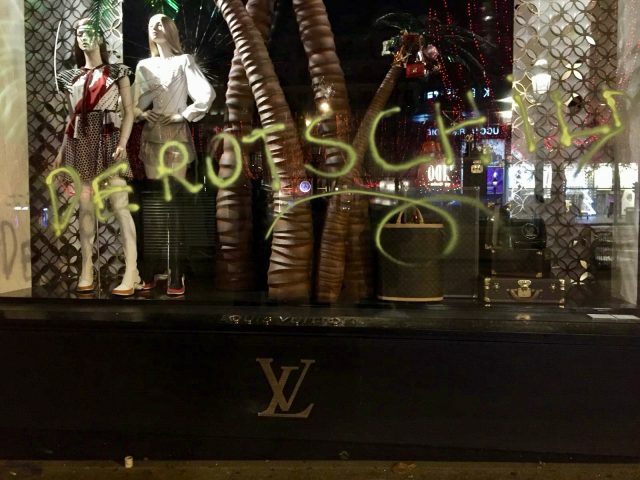 The word “Rothschild” tagged on the Louis Vuitton store is a direct reference to Macron’s work with the financial group, as well as a criticism of the elite classes, luxury brands and the cost of living in France. The demonstrations started in early November to express severe discontent for planned tax hikes. Since Nov. 17, hundreds of thousands of protesters have blocked highways across the country by setting up barricades and deploying convoys of slow-moving trucks. One protestor, 63-year-old Chantal Mazet, was ran over and killed by a mother trying to take her child to the doctor. Demonstrators in the streets of Paris threw bricks and bottles at police, who responded with water cannons and tear gas. According to Transport Minister Elisabeth Borne, the tax on gasoline will increase by approximately 12 cents per gallon on Jan. 1. The tax on diesel will rise by approximately 28 cents per gallon. France already has some of the highest gasoline prices in the world. On Monday, Nov. 26, gasoline cost around $6.26 per gallon in Paris, while diesel cost around $6.28 per gallon. Macron says the taxes will help reduce France’s dependence on fossil fuels. By raising the cost of diesel, the government hopes to convince more people to purchase vehicles that are not powered by fossil fuels. These proposed changes are particularly serious for the working-class people who live outside of France’s large cities. “There are two Frances: There are the better off people who live in the cities who can afford to think about climate change, and then those living in the rural areas and small towns, a lot of blue collar workers, [who] can’t make ends meet,” NPR’s Eleanor Beardsley reported from Paris. Despite the movement’s grassroots beginnings, an Odoxa survey conducted for Le Figaro and Franceinfo showed that 77 percent of French people find their demonstrations legitimate. The national attention that the protests have gained has opened the door to wider criticism of Macron’s presidency, his attempts at economic reform and discontent with the high cost of living in France. The movement has united retirees, the unemployed, farmers, housewives and people who have never protested before through a common anger at the government, as well as disapproval for Macron in particular. A second survey by pollster BVA showed that only 26 percent of French people have a favorable opinion of Macron. He is believed to be out of touch with the majority of French society and is often criticized for prioritizing money and the economy over social concerns. During the election, he was portrayed as a “candidate of finance,” primarily because of his former career as an investment banker with the elite Rothschild & Co. However, Macron is also facing opposition from environmental groups who say he’s not sufficiently committed to fighting climate change. Nicolas Hulot, Macron’s chosen environment minister, quit this summer in protest against his environmental policies. Macron made it clear that the fuel hike isn’t going away, but promised to take steps to help the working class. The government is also offering financial incentives to help people switch to more eco-friendly cars, such as ensuring automakers fund new car trade-in payments. But the demonstrations are a definite blow to his presidency and show the disconnect between Macron and society. 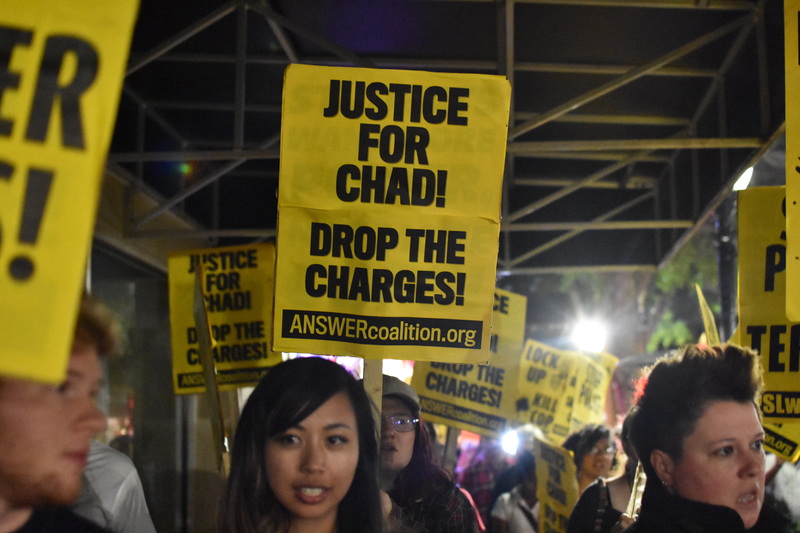 Information for this article was gathered from npr.org, nytimes.com, bbc.com and lemonde.fr.